In Memory of the November Pogrom in 1938 | Initiative Opferdenkmal e. V.
On 9 November, the 70th anniversary of the November Pogrom against the Jewish people in Germany in 1938, the schools of the Hochtaunuskreis – the county in which FIS is located – participated in a memorial service at the Gluckenstein School in Bad Homburg. The event was attended by all the principals of the area schools as well as Landrat Krebs (district administrator), the mayor of Bad Homburg, Frau Jungherr, and many other local politicians. The program included speeches on historical aspects and the local impact of the pogrom and ended in a prayer sung by Rabbi Steimann. The service was accompanied by an exhibition with contributions from eight different schools. FIS students were very involved in the memorial service. Ann Bödiger and teachers of the performing arts worked together with the Student Forum and Upper School students to create some very moving performances. Luis Chaves composed a musical piece especially for the commemorative event which he played together with his father. The FIS Singers sang two beautiful songs in memory of the Jews whose lives ended so abruptly 70 years ago. And drama students performed an evocative pantomime from “The Holocaust Trilogy”. Preceding the event, Ann-Sophie Amler and Christopher Sladdin from the Student Forum had organized a hike from the Holocaust Memorial in Oberursel to the Gluckenstein School in Bad Homburg. 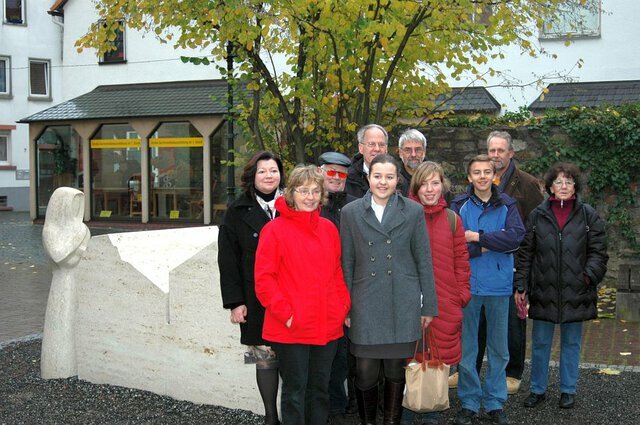 Seven members of the Oberursel Association “Nie Wieder 1933” (Never Again 1933) were so impressed with the students’ initiative that they sacrificed their Sunday morning and braved the rain to see the FIS group off. The November Pogrom was also discussed in classes in the Upper School in advance of the events from Sunday. As part the project and in order to learn more about the occurrences in 1938, Ann-Sophie, Christopher and Janina Raschdorf interviewed Angelika Rieber, the author of “Wir bleiben hier” which focuses on the lives of Jewish people in Oberursel at that time. The interview is available on the Student Forum page of the website but was also the subject of discussion in German and history class. The school is very proud of the students’ initiatives and congratulates them on being superb ambassadors for Frankfurt International School within the local community. Dieser Beitrag wurde unter Engagement abgelegt und mit English, Jugendliche verschlagwortet. Setze ein Lesezeichen auf den Permalink.